ANNAPOLIS, MD (February 1, 2018) – As you walk through the woods this February, most plants will appear dormant, but heavenly bamboo (Nandina domestica) will be on full display. While often used as an ornamental plant, heavenly bamboo invades natural areas in Maryland and it can even be toxic to wildlife. 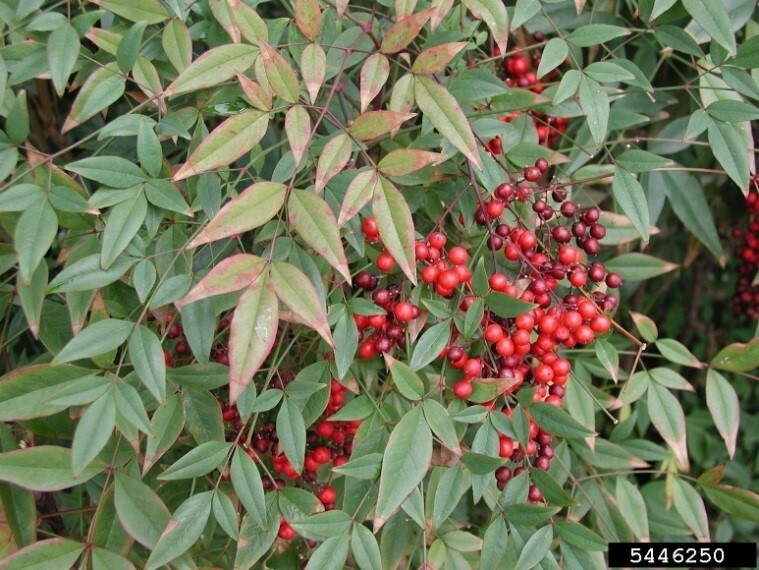 With its evergreen leaves and bright red berries that persist through the winter, this invasive shrub is easy to spot in the winter. For this reason, the Maryland Invasive Species Council has chosen heavenly bamboo as its February Invader of the Month. Heavenly bamboo is an upright evergreen shrub, although it may be deciduous in some areas. It typically grows 4-8’ tall, in multi-stemmed clumps. Its compound leaves resemble bamboo leaves, giving it its common name. Leaves are alternate, dark green, and slightly shiny, turning reddish in the cooler seasons. Leaves are 2-3 times odd pinnately compound, with narrowly ovate to lanceolate leaflets, about 1-2” long. Stems are dark green and shiny, resembling bamboo. Older stems develop bark with long linear grooves. In late spring, heavenly bamboo will develop tiny white flowers in erect clusters with yellow anthers. These are followed by bright red, round, 2-seeded berries (about ¼- ½” wide) that persist through the winter. Heavenly bamboo is native to China, Japan, and India. It was introduced to the United States in the 1800’s as an ornamental plant. Since then, heavenly bamboo has naturalized and become invasive in the Southeastern U.S., occurring from Maryland to Florida, and as far west as Texas. It occurs in disturbed areas and urban forests, but is also capable of growing in shaded forest understories, and has been found growing in undisturbed forests in some states. In Maryland, heavenly bamboo has naturalized in at least two counties: Prince George’s and Frederick. Heavenly bamboo reproduces both from roots and seeds, and displaces native vegetation where it invades natural communities. Its leaves and berries are also toxic to livestock, birds, and other animals. In Maryland, it has been classified as a Tier 2 Invasive Plant, and now requires a warning label for potential environmental harm where it is sold. Prevention is the best control method for heavenly bamboo. It should not be planted in landscapes and gardens. Because it has a large root system and can reproduce from root fragments, hand pulling is only appropriate for removing small specimens growing in loose soil. Any fruits should be bagged and disposed of. Larger individuals can be controlled by cutting and treating the stems with glyphosate or triclopyr. Control treatments should be done from late summer to fall, and avoided during the spring. In some dense stands, foliar sprays may be more feasible. Spray with glyphosate or triclopyr during the winter, when other plants are dormant. Care should be taken when using glyphosate, because it is a broad-spectrum herbicide, and could harm non-target plants.